Today is my last post for the Neat & Tangled April release. It's been a lot of fun being able to work with all the amazing new N&T goodies. Danielle and the folks over at Neat & Tangled are so sweet and talented, and it's been a blast! For today's post, I'm highlighting the Inlaid Square Coverplate. You saw me using this yesterday, and here is another way of using a coverplate. 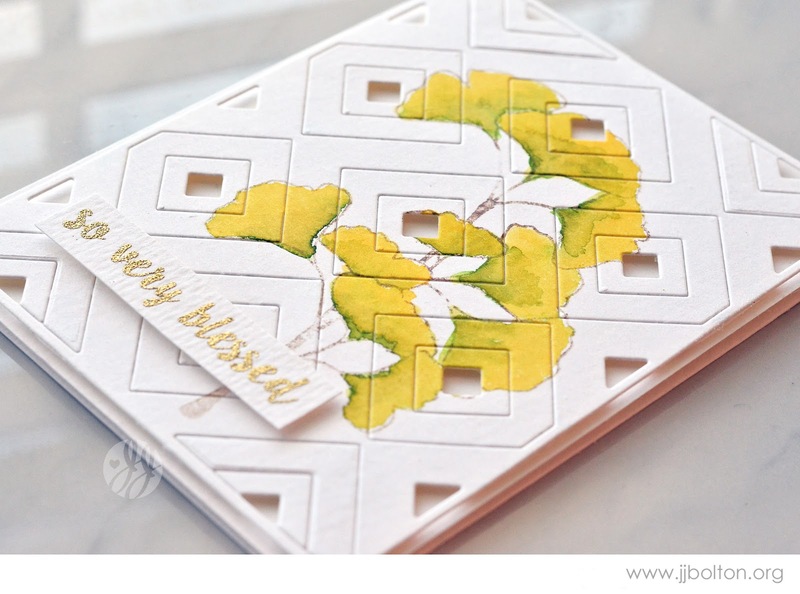 I started by watercoloring a simple image of the gingko leaves from Have Courage. Then I used the coverplate to cut the image. The key to making this technique work best is to 1) use a simple, bold image and 2) choose a die that contrasts with the image (the leaves have a natural, organic line which is a good contrast to the straight lines of the die). 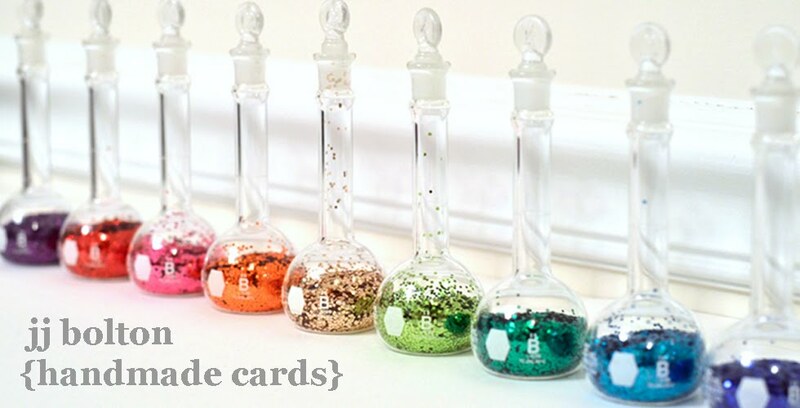 This is one of my favorite types of cards to make. If you go over to the Neat & Tangled blog you'll see more coverplate action! Wow! Your card is so beautiful and very elegant!!! Love it!!! What a super clever take!! Love the CAS feel of the card! Amazing work! Extraordinary! Thank you for the inspiration! 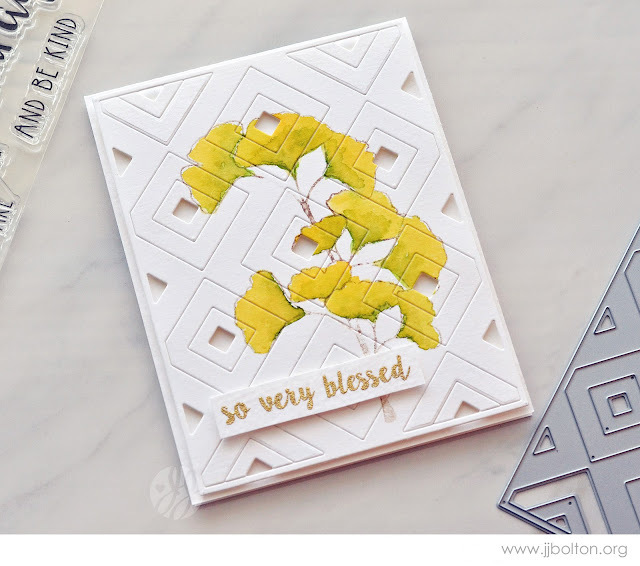 Another fabulous card using that cover plate die! So elegant. So pretty - love how you watercolored the image before cutting the cover plate. WOW!! This is just oh SO COOL!!!!! That’s a great card design ! Very pretty. I like how you stamped on this coverplate. I am totally in love with this one! Love the white with the select pieces missing and the stamping/watercoloring over top! I think this is so clever! I would never have thought of this! You take chances that always pay off in a wonderful way!